I'll admit it, I was interested in Freakonomics because of the hype. Not that I was falling for the praise per se, but the fact that the masses were reading an economics book was intriguing enough. It's not a Motley Crue biography, it doesn't promise rapid weight loss, and it doesn't expose any fraudulent Republican. Perhaps some credit can be given to the cover buzzwords (freak, rogue), perhaps more can be given to the clever apple/orange photoshopping, but it seems to me that a lot of its success can be attributed to positive word of mouth. As unlikely as it sounds, people from all walks of life were enjoying a book about economics. Well, almost everyone. Apparently some economists argued that this isn't really economics at all, to which the authors suggest that when you consider economics is, at its root, the study of incentives, they have in fact written an economics book. Regardless of what you call it, since it was first published in 2005, it has sold over 4 million copies. Not too shabby. Some critics also took issue with the whole "hidden side of everything" (emphasis mine) goal. Perhaps it's a bit too far reaching and perhaps it isn't quite focused enough, or as Levitt and Dubner admit, it lacks a "central theme." I wasn't too bothered by this. It certainly didn't show the hidden side of everything, but what it did show was interesting. Sometimes, however, I was bothered by the claim that all one had to do was ask the right questions and he could better make sense of the world. Possibly that's true, but some of the questions asked in this book were clearly asked after the fact. "What do school teachers and sumo wrestlers have in common?" Answer: given the right (or wrong) incentives, both cheat. But give me a break; that chapter title is only used for quirk appeal. The research guiding the chapter was based on a few different questions: do teachers cheat and if so, how can we catch them, and do sumo wrestlers cheat and if so, how can we catch them? It's the "how can we catch them" part that has proves the most problematic. While the authors suggest that they have a way of manipulating data and analyzing correlations, many of their methods and conclusions have come under fire. And for a lay reader such as myself, there's something ironic about the way they preach the value of questioning, but we're supposed to trust their methodology and conclusions. 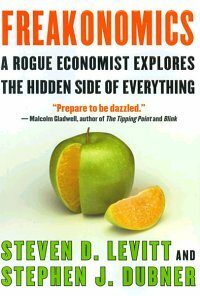 Still, I do think that Levitt and Dubner believe in their work (or in Levitt's work in any case, as he's the "rogue economist") and that data can be found and interpreted with their results is at the very least very intriguing. For instance, they believe that legalized abortion led to a decrease in crime (arguing that people who grew up "unwanted" are more likely to commit crimes). They have statistics to back it up. In this case, I found myself wondering things I hadn't considered before. For instance, could a similar correlation be found with the invention of "the pill"? If their conclusion is correct, the pill also should have decreased the number of "unwanted" people and therefore, there should have been a similar drop in crime. If the above sounds callous, Levitt and Dubner claim to just present the numbers, not to make any moral judgements. For instance, just because they make the "abortion decreases crime" case doesn't necessarily mean they support abortion. They are not arguing that the end justifies the mean. For the most part I think they did a good job of keeping their own opinions at bay. Not only does this lend their "numbers don't lie" argument more credibility, it was also wise from a political standpoint considering that they took on such potentially explosive issues as race and abortion. However, in my revised edition they've added some of their blog posts from Freakonomics.com and with those I thought their values and political stances were much more transparent. For instance, Levitt at one point ponders a career change to focus solely on catching teachers who cheat. It's revealing that he doesn't express any concern that teachers have incentives to cheat in the first place. Despite the flaws, or possible flaws, it inspires a lot of contemplation with its down to Earth style and unique positions. A fantastic write-up, John. I doubt my TBR pile will ever let me get around to actually reading this book, but you've got me thinking about a few interesting points now. This sounds like quite a fascinating book. With a subject like economics, much depends upon the storytelling ability of the author.